I'm pretty new to photography, and I'd love any suggestions you may have. Are the birds a nice way to break up the otherwise-boring sky? Does the slight blur keep the attention on the city, or is it distracting? What else would have made this better? Lovely photo, lovely light and composition. Are the birds a nice way to break up the otherwise-boring sky? Yes, the birds are a good touch. Does the slight blur keep the attention on the city, or is it distracting? What else would have made this better? The main issue with this image is that nothing is sharp. My guess it was taken hand held. I'd suggest using a tripod (or a home made bean bag to rest your camera if you don't have one), using a lower ISO, which would mean less noise and a smaller aperture (i.e. bigger the f-stop) all of which would help to make your image sharper. Tripods are a worthwhile investment. My landscape photography has improved dramatically since using a tripod and the timer as it minimises camera shake. The main issue with this image is that nothing is sharp. I think the softness could be related to the software used for downsizing. Here it is after a little bit of Unsharp Mask. I like the birds, but I would have preferred either to have them sharp, or to have them show a lot of movement (by using a slow shutter speed). The buildings are nice, but not particularly interesting. It seems a tiny bit tilted. Such images are more powerful, I think, when they have something interesting in the foreground. The birds would work if more emphasis was put on them. Not a bad start on cityscapes. As mentioned a tripod works wonders as does a remote release. It you'd like some inspiration take a look at Tim Durkan's work. As said in previous comments, overall softnes is not good and can be avoided with tripod. And with tripod You could use smaller apertures maybe 8 or 11 and shot will be sharper and smaller ISO could be used. And also I might have used wider lens... or even multishot panorama, because it missing something from right. Is there more high buildings? Personally I don't like those birds because they are out of focus. Reduced graininess with a lower ISO would have been nice, as would having the birds in focus and a little extra sharpness from a smaller aperture. But this is all a big compromise, right? I have to give something up to get each of those advantages. A longer shutter speed would have blurred the birds even more. What settings would you have used? I have a small tripod that I was using at the time (Joby GorillaPod SLR-Zoom ), but perhaps that's not quite enough especially at a longer focal length? I hadn't heard of using a bean bag - seems like a good low-cost accessory to keep around. I'll put one in the car. I have since obtained a remote, which I'm sure helps even more. I see my camera supports remote shooting as well as a "remote + 3 seconds" mode. I understand using the timer when using the camera's shutter release, but does it add much with remote shooting? I have a photography book I've started, but haven't made it to the digital processing chapters yet. I have an old copy of Photoshop Elements (version 4, bought new in 2005). My understanding is that I'll likely want to invest in Lightroom once I start getting comfortable. Anyway, I resized the photo with PSE's default settings because I didn't know any better. A quick look at the help files showed me the Bicubic Sharper resampling option, which gives me slightly better sharpness (below). I don't know anything yet about digital sharpening, but does the "Unsharp Mask" really actually sharpen an image? What a strange name if so. There are more buildings on both sides of the frame, including taller ones to the right and the Space Needle a good distance off-camera to the left. I limited the frame to only these buildings because I liked the building height/frame height ratio, and because the reflected light was much less interesting further out. Should I have avoided placing the right edge in the middle of a building? Last edited by Will in Seattle; 02-25-2015 at 12:22 PM. shooting skyscrapers is similar to shooting mountain ranges; you don't put the tallest mountain in the middle and you if you cut off a mountain it needs to be a leading line. with mountains/skyscrapers you want low to high with highest peak on a 1/3 comp line, or a high to low to high again using rules of comp to place peaks and valleys. you have a couple things compositionally going against you, the bump of the skyscrapers combines with either lens distortion or shoreline change that makes the picture feel as if there's a hump right in the middle. a 1 stop stop graduated ND filter would have brought out the colors (purples) of the sky more. the softness is from iso 800 and underexposure. add a wide open aperture and that softens things even more. I'm guessing the majority of the frame is at least 1-2stops underexposed because of the bright building in the center of the frame. This probably should have been a 2-3 second exposure at iso 100 which would have definitely required a tripod. Shot at f8 you could be up to 5 seconds. 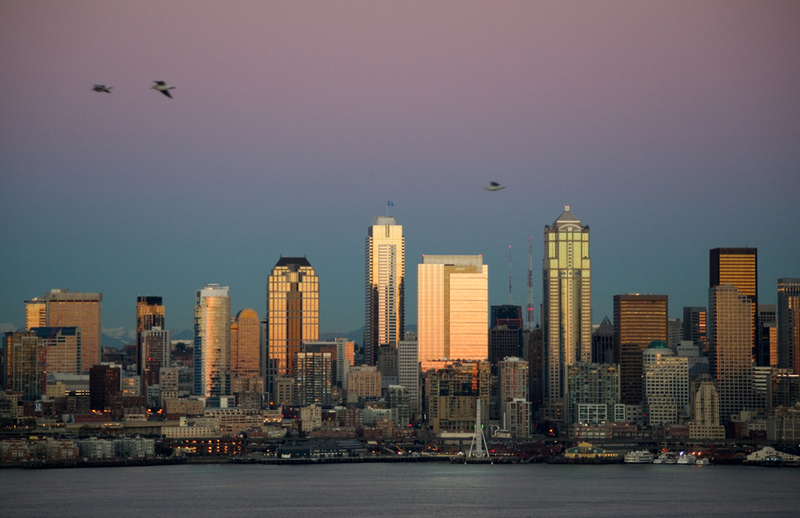 I have a Kerry Park image in my online portfolio under similar lighting conditions. I was up to 8 seconds at f13. I think had you shifted your composition to the right and started with the building with the blue flag you would have had interest along the waterline (boats) as well as a better flow of skyscrapers heights. you also would not have placed the radio antennae and the ferris wheel so centrally. as long thin straight lines they compete for attention. nomadking - thanks for the great review. Good eye - indeed this was taken from the park/viewpoint above Alki, which looks to be the exact spot you got your panorama. I'm just starting to discover/experiment with compositional principles, so your advice there is quite valuable. I'm less sure about the birds though ... wouldn't losing them make the cloudless sky pretty boring? I could always crop it down, but then I lose the color. Maybe the graduated ND filter helps with that? I hadn't heard of the before - they look like a great tool. In a situation like this where you want to keep tall buildings consistent, would you use a softer edge and start it just above the buildings? Thanks for the advice on the longer exposures. I can see how that would really help with the sharpness/graininess, which would clearly improve the image. I'm less sure about the birds though ... wouldn't losing them make the cloudless sky pretty boring? I could always crop it down, but then I lose the color. Maybe the graduated ND filter helps with that? I hadn't heard of the before - they look like a great tool. In a situation like this where you want to keep tall buildings consistent, would you use a softer edge and start it just above the buildings. I can only speak to my philosophy, but if semi-blurred birds are an important compositional element, the image needs a lot of help. you touched on the frustration of landscape photography; you can be in the right spot at the right time but things don't always work out. your instincts are also correct, a cloudless sky doesn't contribute much an the overall image. but as my mom always preached, two wrongs don't make a right, in this case cloudless sky and blurred birds still doesn't add value to the image. I've planned entire trips around a certain image, only to take 300 pics and get back home and have to trash all of them, not because of some technical error, but because the lighting wasn't up to par and/or clouds didn't cooperate or a dozen other things beyond your control. you so badly want to make something work because you feel invested in it, but it still won't make an image an objective viewer would connect to. you have to be your harshest critic, with an eye developed over time by others being harsh but constructive. I'd say based on your comment, you have some good instincts, learn to trust them and couple that with more advanced technical shooting and you'll be happy with your results sooner rather later. The really great thing is that this scene is readily available, you can experiment, you can build upon little successes, even if it means sending 1000 (or even 5000) pics to the recycle bin. But that one day, on your 100th trip, the clouds part (literally in seattle) and you get that sunburst and because you have the composition down and the exposure down, you'll nail that picture and hang it on your wall like a trophy! Honestly, if you wouldn't grow bored of the task, I'd say every Saturday at sunset for a year take the same image, honing in on the perfect exposure and composition. try different things (like composition, faster shutter, longer shutter, small aperture, big aperture - since it's landscape you should be at 100iso, but try to catch a ferry and learn what compromises you have to make, how far you can push the iso, what you aperture needs to be for the shutter speed you needed to stop the motion). Don't leave until you've taken 50 pics (or more if you want). That would be roughly 2600 pics of this image under different lighting conditions, weather conditions and your own emotional conditions. You will learn a lot and you will see your progress because you have other images to compare against. each week you can decide what you could have don't better, what you really like and want to do again. You can try different equipment, like GND filters, even diff GND like 1-stop, 2-stop, CPLS etc. Try different lenses, different Field of View, tight and panoramas. Once you've mastered this scene, you can take all that accumulated knowledge and apply it to your next image somewhere else. Last edited by nomadkng; 02-26-2015 at 02:14 PM. All this advice/support is exactly what I need at this point. Thank you very much for your insight. I personally find the birds a distraction. The image isn't that bad, but knowing the Seattle skyline, this image does lack a bit. Coming from your other thread, you could most certainly do some things to the image to improve it, but they would be only marginal. You could use cloning or a healing stamp to remove the birds. Negative space isn't a bad thing, which is what an empty sky can do. The shoreline is at a good location and help towards the rule of thirds if that is your goal. As someone in the other thread stated, shorelines are rarely straight, so I wouldn't worry about that. I'd focus more on making sure your buildings are vertical. That is a bit easier to achieve (and I think you have here anyway). There are lots of discussions online about tripods, but you do have to spend a fair amount of money to get one that is fantastic. But, using a tripod, with a remote, and perhaps with the 3-sec release (raises the mirror, turns off shake reduction, which in turn allows the steadiest shot you can get), and you'd eliminate blur from camera shake (but not necessarily the birds). If I had been shooting the shot, I would not have worried about the birds at all. I would have focused on the landscape and getting a nicely sharp image, and I probably would have tried to shoot with a low iso and long shutter speed. I probably would have also widened the shot a bit and included the Space Needle or even the stadium and port to the right. Have to agree with nomadkng, get out and shoot the same thing over and over, be very critical about what you take and determine for your self what works and what doesn't. Then figure out why it's working/not working so you can repeat or correct it next time. I have a few where the clouds tower over the city, but most of the time the skies and water need to be trimmed out. Not as sharp as I would like, but a tripod does not do you a lot of good on a moving boat.